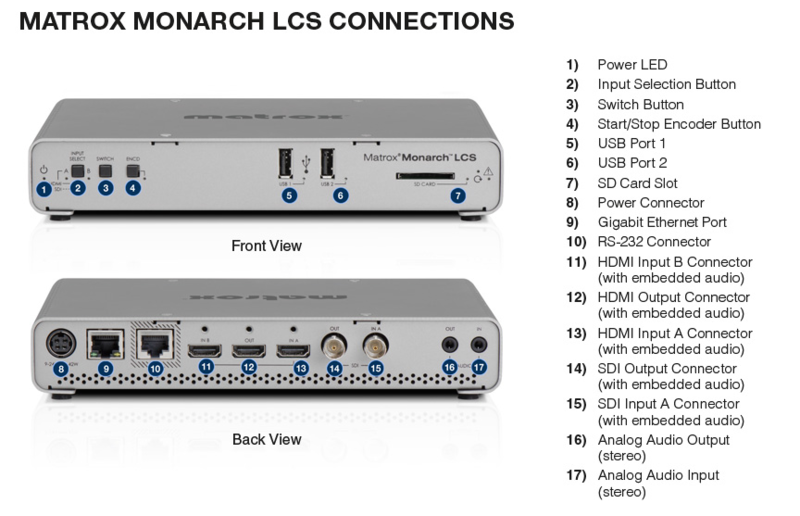 At $2,495, the Matrox Monarch LCS is an inexpensive dual-input lecture capture solution with two output channels that can be independently set for recording and/or streaming. You control the unit via a standard browser, and you can connect a monitor for setup or monitoring. There’s an application programming interface (API) for integration with learning management and similar programs. The unit is based upon the proven Monarch hardware and software, and it performed well in our tests, though rough edges in the software remain from previous reviews. Physically, the unit is about 6" front to back, 8.5" wide, and 2 inches high, about the size of a 300-page hardback novel (Figure 1, below). As you can see in Figure 1, the unit has two HDMI inputs, one for a camera and the other for computer input. If you’re working with an older computer that doesn’t have HDMI output, you can buy a VGA- or DVI-to-HDMI adapter for under $10. There’s also a single SDI input for video, and HDMI/SDI outputs to a preview monitor, which isn’t essential but I found very useful. The unit accepts up to 1080p output in either NTSC or PAL rates, but goes no higher, so if you’re looking for a 4K solution, this isn’t it. As you can see on the far right in Figure 1, there’s a 1/8" (3.5mm) input port for unbalanced audio, supplementing the audio you can input from the HDMI or SDI sources. There’s also a headphone jack of the same size. On the front you have three buttons for choosing the input stream and start and stop encoding, though most users will prefer the browser-based software controls. There are two USB ports for connecting external hard drives for recording, and an SD slot for recording to that portable media. You control software operation from a browser on any device running on the same network as the Monarch, so you can use a computer, tablet, or even smartphone. If you connect a monitor and then boot the system, the unit will display its IP address while booting up—a nice alternative to downloading software from Matrox to search your network for the IP address. If you run without the monitor, you’ll have to download the software. You control input/output configuration and the appearance of the stream in the Production Settings window shown in Figure 2. Conceptually, you can input one or two streams into the unit and output one or two streams. You control the viewing modes of the inputs via the five layout choices shown on the upper left of Figure 2 (below). Running through the options, you would use Single Isolated mode for a single input, which you can stream and record if desired. You would use Dual Isolated mode to create two streams to send to a player in a learning management or similar program that can input them both and allow the user to change the viewing configuration as desired. In all cases where you input two streams, the Monarch synchronizes them so all content will be played at the same frame rate with no loss of audio/video sync. In Switcher mode, you input both streams and switch between them using the two buttons in the Operating Mode box on the left in Figure 2. I tried this mode, and found switching very responsive. 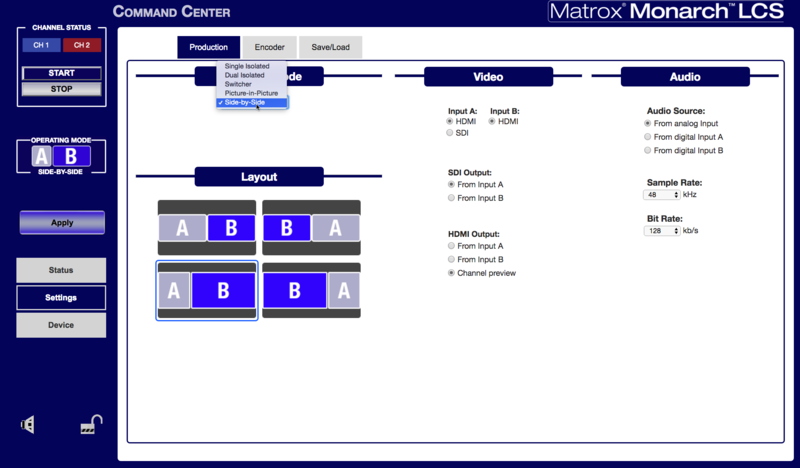 The dual-stream use case--one for streaming, one for archive or other production--is very common in live production, and Matrox Monarch HD, a $995 compact standalone streaming/recording unit, appears to be the lowest-cost solution--and a highly competent one at that. In this interview from NAB 2015, Shawn Lam and Matrox's Dan Maloney discuss the Monarch HDX, which ships in June and builds on the success of the Monarch HD streaming and recording appliances by adding more flexibility in the 2 existing encoders, and adds a third encoder for preview. The Monarch HDX is well featured, easy to use, and reasonably priced, and produced very good quality output. Those seeking a dual-channel hardware encoder should definitely include the product on their short list. Jan Ozer discusses simultaneous streaming to multiple platforms simultaneously using Matrox Monarch HDX and Teradek T-Rax at Live Streaming Summit West.